Well as I started dusting off old kits, I decided to post this one. 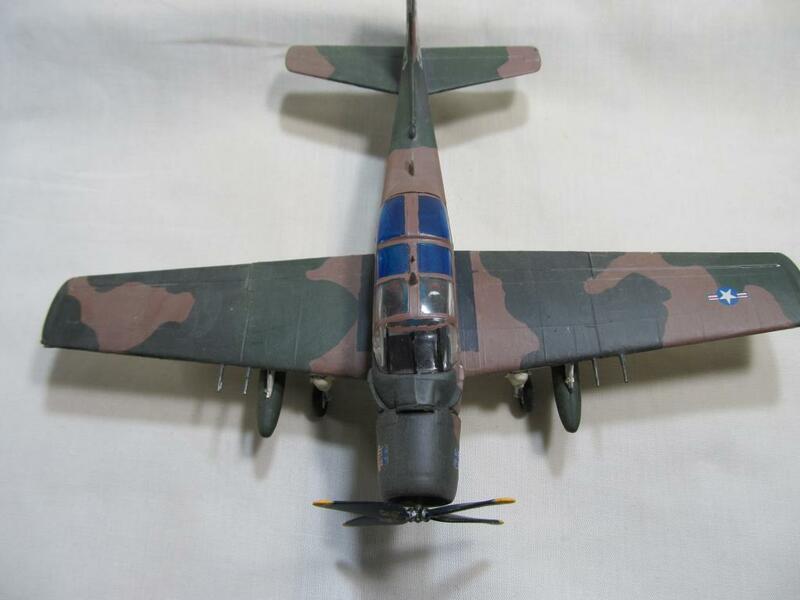 It`s the old Monogram/Revell kit. Not a lot to it, not much in the way of under wing stores. 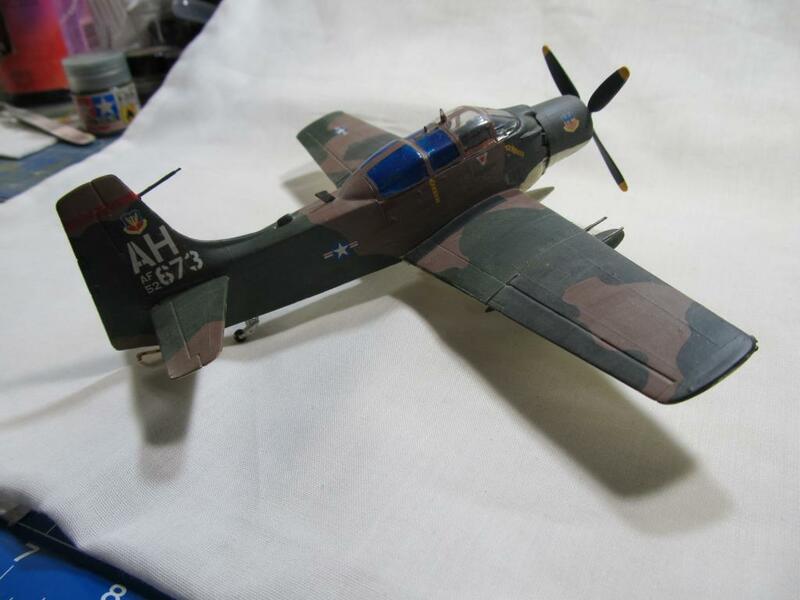 Glued and painted by me, using brushes and Tamiya paint, I know , Tamiya paint does not brush well, as I found out. Done S.E.A colours (one of my favs). 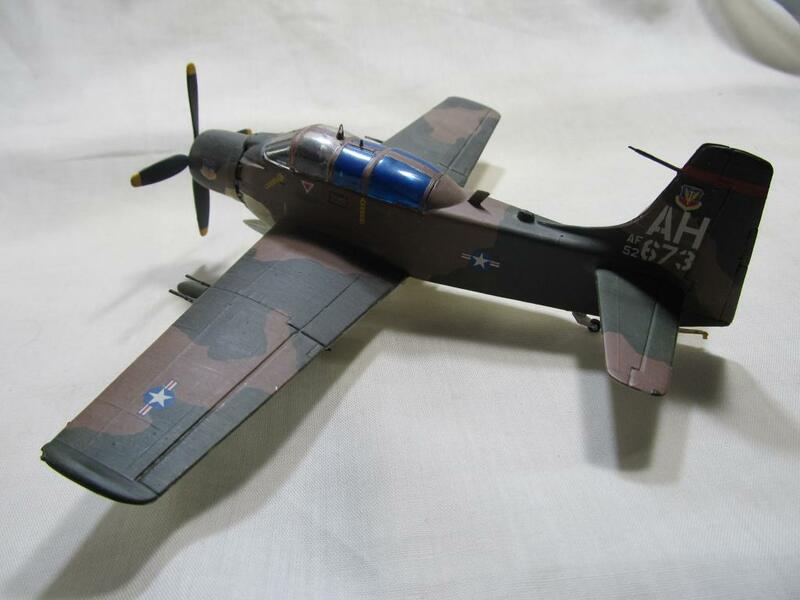 22 responses to Skyraider, an old one, very old indeed. Doesn’t look all that bad to ME, Simon…R/M you say? What scale..? Sorry I forgot to put that in. 1/72nd scale, it even had the old Monogram lettering printed somewhere on it. Looks like you had a lot better results brushing Tamiya paint than I ever did. Thanks Al, it was like painting with mud!!!! Nice job on the camoflage, Simon. Cheers George, was done free hand, in like we use to do , all those years ago. Simon, you’re correct about brush painting using Tamiya paint, I’ve had no luck with it either. Nice job overall, it looks good from here! Thanks Mike, we all learn. At least I did not have to worry about how to mask something back then. 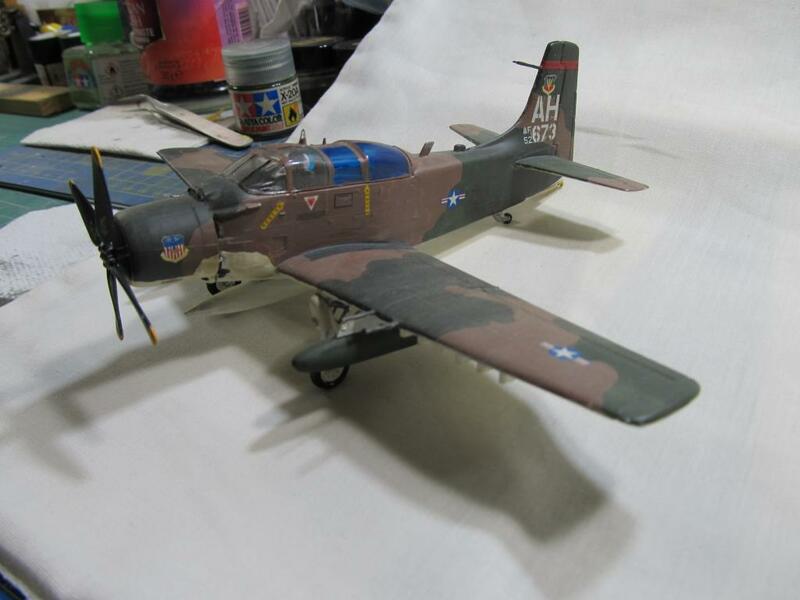 Simon, nice job on your Skyraider, that’s certainly the best brush painting job I’ve seen with Tamiya paints. I got so frustrated with them I gave away all I had as a “white elephant” prize. On the other hand Tamiya spray paint are the best I’ve ever used.. Cheers Rick, I found out the hard way. 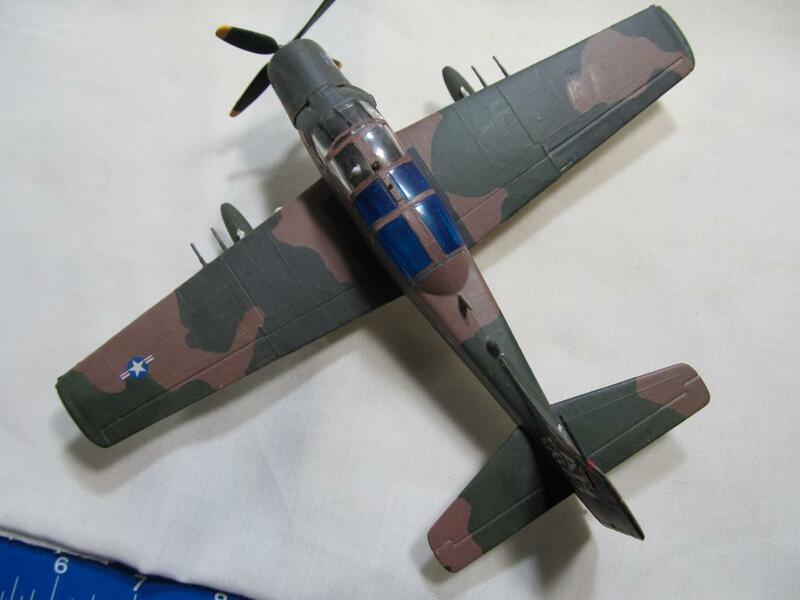 The Tamiya Acrylics are great for spraying, I use I.P.A. and goes on a treat. Thank you Bob, yes back in those days, I don`t know how I was able to get a decent finish with that stuff. This is one of my favourite Skyraiders. I remember as a child of 12 drooling over the old Matchbox kit in quarter scale. Today she fades in comparison to Tamiya/Hasegawa but with some TLC still builds into a nice kit!! Well done Simon!! Cheers Morne, I will get to one of the Tamiya kits one day. One of my Fav planes. Still the only “station wagon” version in 1/72, as is the 48th Matchbox/Revell recent reissue. Not as racy as the single seater, I guess. You are probably right about the re-issues Bernard, this kit had the decals for the Navy?Marines version with Grey uppers and White lowers. I did the S.E.A. scheme to match in with some builds in the stash. Old but still very good quality build. 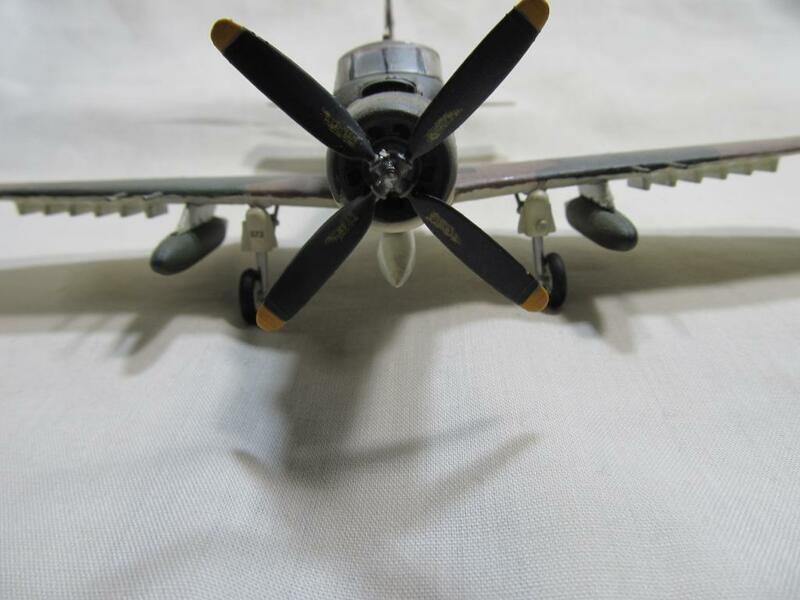 Interesting version of the Skyraider. Thank you Dirk, she did not have much in the way of stores in this kit but you could probably find some in the spares box to give it its hostile look. An old favorite, and still a nice kit (for it’s age) Well done ! Cheers Joe, I was doing some dusting and decided to post a pre site build.